(February, 15th, 2016) The Japanese government today launched an official English language Twitter account for its G7 Presidency in 2016. 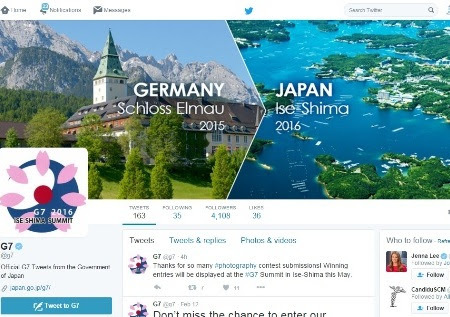 This follows the handing over of the @G7 Twitter handle by Germany, which hosted the 2015 G7 Summit in Schloss-Elmau. Germany’s handover message to Japan was its final tweet on the account. The first tweet by Japan was a thank you to Germany. The @G7 Twitter account is the place to go for the latest official tweets on the G7 Ise-Shima Summit taking place on May 26-27, and the 10 ministerial meetings Japan will host between April and September. Tweets will include links to the latest news, agenda updates, facts and figures related to the G7 Summit and ministerial meetings, and the 11 host locations. They will also offer links to photos, video, reference materials and archives.